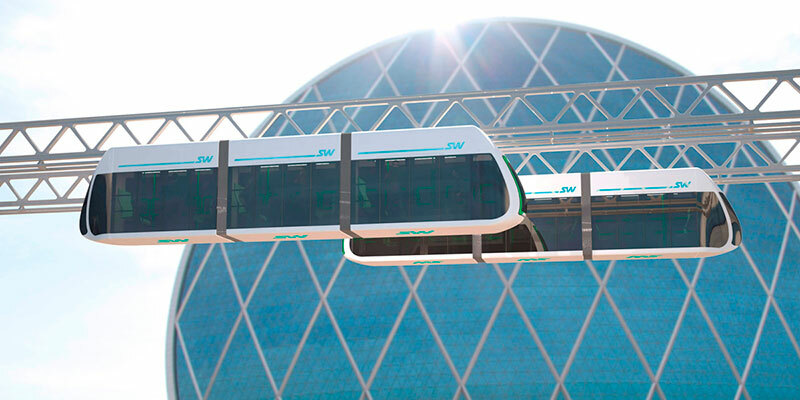 Urban transport SkyWay is an innovative solution in the field of public transport for cities and suburbs. Time is the most valuable resource today. In the conditions of big cities, we are painfully lacking time. We spend about 4-5 hours per day for transportation. Urban SkyWay is ready to come to help. It is a transport system, located on the "second level", above the urban transport traffic. Maximal speed up to 150 km/h and absence of obstacles (oncoming and preceding traffic, animals, pedestrians, pits, cars parked in unsuitable places) on traffic routes allow to significantly shorten the travel time. Modern automated self-propelled module on steel wheels of a suspended or mounted type - unibus - provides transportation of people and cargo. It is equipped with air conditioning and comfortable armchairs. It is not stuck in traffic jams and operates in the mode of 24/7/365. SkyWay track structure has no crossroads, pedestrian crossings, and as a result - no pre-conditions for road accidents. The system of safety and complex control, developed by our specialists, ensures automated control for rolling stock and energy supply system. It works out optimal solutions with the purpose of providing safe mode for complex operation. The track of an overpass type does not violate local topography, biogeocenosis and biodiversity of the adjacent natural urban territory. It does not destroy the fertile soil and vegetation on it. It does not interfere with the movement of ground and surface waters, movement of people, domestic and wild animals, operation of building and special machinery. The net cost of urban rapid transportation is twice lower than that of transportation by underground metro, three times lower than by tram, five times lower than by monorail way. SkyWay system is automated, it does not require cleaning, marking - in general, remuneration of labour for additional employees.